> This Japanese pursuit video is just hilarious! This Japanese pursuit video is just hilarious! Car chases or pursuits have always been something of my favourite, whether they involve the police or not. As a matter of fact, that's one reason why I love movies like 'Transporter' (starring famous actor Jason Statham) and 'The Fast and The Furious'. With that being said, if you're like me, then the following video should be of your interest, too, somehow. I found it quite interesting, at least while waiting for the 'Fast and Furious 7' - which will also star Jason Statham - to be released in theatres in July 2014. The video was shot by - a pretty creative Japanese guy, I would say - someone known as LUXE37 on YouTube. While car chases will normally endanger human life, this one puts no harm on anyone at all. It's because the video was shot in a miniature retro Japanese city. Not only is the city retro, even all the automobiles involved seem retro as well. It seems like the automobiles used were those that came from the 80s, if not the 70s. However, being shot in a miniature city doesn't necessarily mean that this video isn't interesting at all. In fact, I think it's worth watching. It's also quite humourous and features plenty of crashes, even an explosion! And, despite the fact that the automobiles were all retro, they somehow produced V8 sounds, too! You bet, the sounds are fake, of course. One thing that caught my attention was the guy driving the blue muscle car. He must have been like a really skilled driver if he existed in real life. 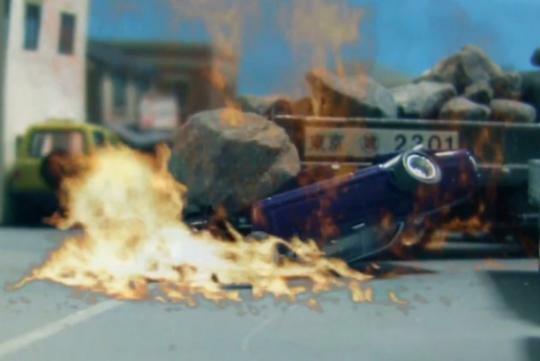 He seemed to know every inch of the city and where he can escape the chasing police officers through narrow alleyways, well, until the car finally exploded, of course. LUXE37, I wonder if the ambulances actually managed to rescue that driver in the end? He was burning, you see. The blue muscle car looks like the father of GTR...Nissan Prince. Back in the 70s. Could be wrong...but nice video.